Shuaiwen Leon Song, a research scientist with PNNL’s High Performance Computing group, and Chao Li, a Ph.D. student with North Carolina State University’s Department of Electrical and Computer Engineering who spent time as a research intern at PNNL in 2014, are co-authors of, “Locality-Driven Dynamic GPU Cache Bypassing,” which recently was accepted by the 29th International Conference on Supercomputing (ICS). The paper, which presents novel cache optimizations for massively parallel, throughput-oriented architectures, such as GPUs, will be presented during the ICS 2015 Conference Program. 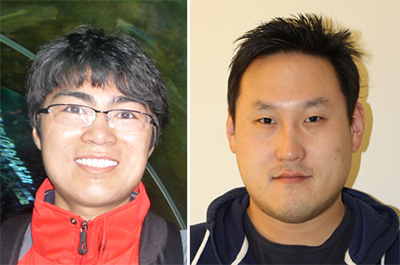 Chao Li and Shuaiwen Leon Song (l to r) teamed on a paper exploring cache architecture designs for improving energy and performance efficiency of commercial GPUs. Enlarge Image. The paper features additional co-authors from NCSU and NVIDIA Research. ICS is a premier international forum for the presentation of research results in HPC systems. ICS 2015 is being held in Newport Beach, California, from June 08-11, 2015. Chao L, SL Song, H Dai, A Sidelnik, SK Sastry Hari, and H Zhou. 2015. “Locality-Driven Dynamic GPU Cache Bypassing.” In 29th International Conference on Supercomputing (ICS 2015). June 08-11, 2015, Newport Beach, California.